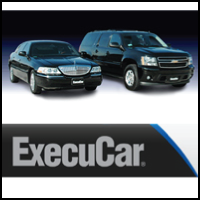 ExecuCar is a personal sedan service created to give customers a private, luxurious way to travel. Our late model luxury sedans and SUVs are operated by our experienced and business-attired drivers making every trip a superior experience. We are offering 10% off ExecuCar Sedan or SUV private services to and from the airport. Must Mention The Employee Network when calling or CLICK HERE to book online using promo code 7A9KJ.